Today we’re in the beautiful university town of Stellenbosch. Majestic tree-lined streets, quirky shops and bars and a happy buzz, this university town offers many dining opportunities. One of the newest ones is chef Bertus Basson’s (of the famed Overture) latest venture, Spek & Bone. The restaurant is named after his pet pig Spek (it means bacon in Afrikaans, poor Spek) and his boxer dog, Bone – who are best friends! There are plenty of pictures of the two of them scattered around the restaurant which is set back from busy Dorp Street down through a narrow passage to a welcoming courtyard shaded by an enormous tree. Despite being a new opening there’s already a lot of history here. The wall on the left as you come in used to be the original market of Stellenbosch. And the huge tree you’re sitting under is the oldest fruit-producing vine in Stellenbosch. So take in your surroundings before settling down to peruse the menu which is a range of tapas-style dishes. 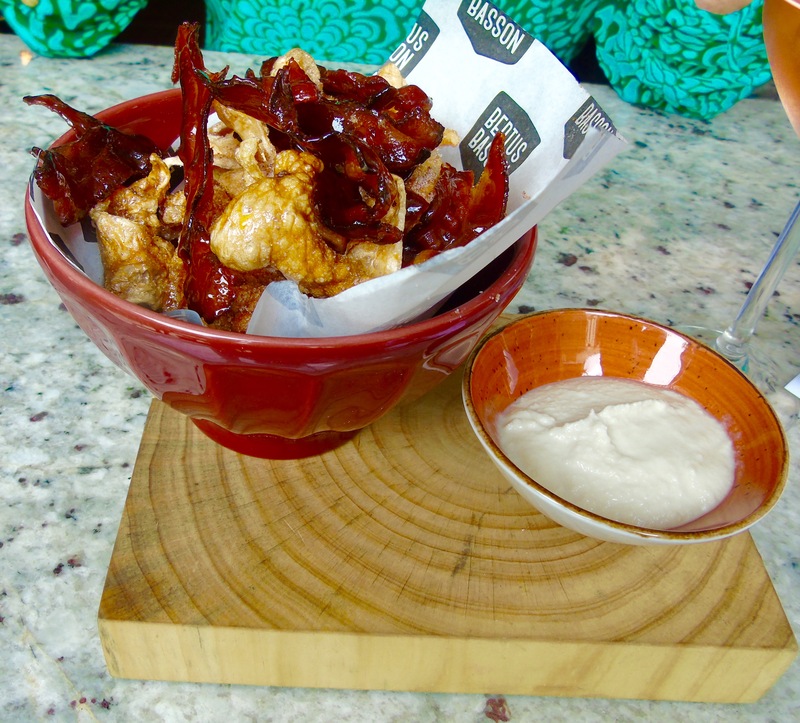 We started with this amazing dish of pork crackling topped with maple bacon. The lightest of crackling with great crunch combined perfectly with the slightly sticky sweetness of the bacon. 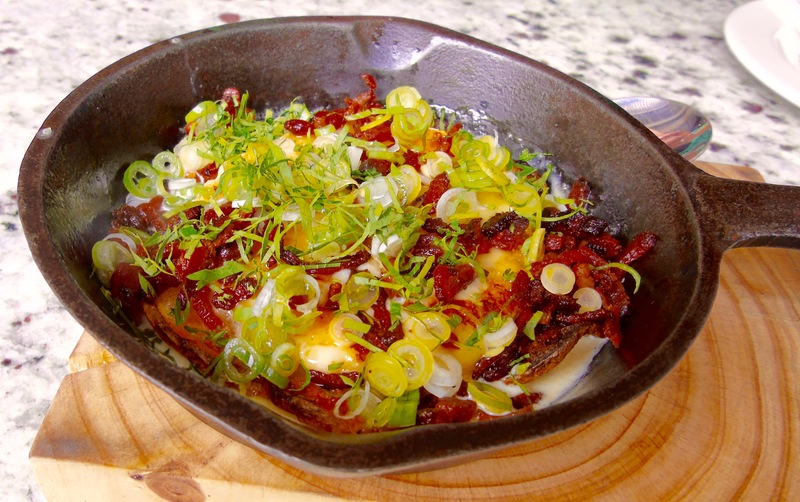 The amazing potato dish was cooked in camembert and topped with crispy bacon and thinly sliced spring onions. Next up, fish tacos. Fresh tuna with a mix of avocado, cabbage, red onions and peppery radishes. 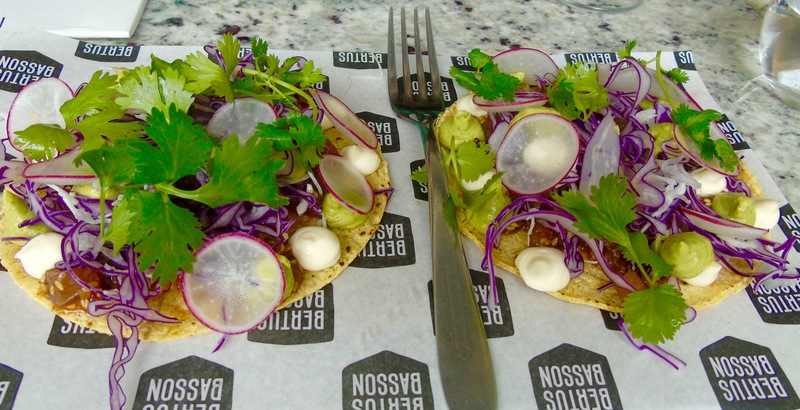 Love a fish taco and these were beautiful with the crunchy vegetables and zesty flavours. 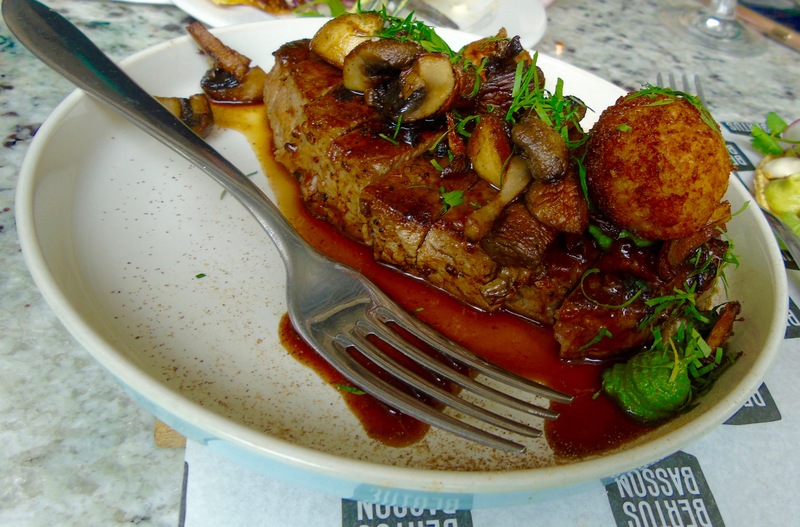 The Chalmar sirloin was served with a Monkey Gland baste, mushrooms, spinach puree and croquettes. Perfectly cooked medium-rare steak and a wonderful marriage of ingredients. Loved the depth of flavour of the spinach which somehow lifted the whole dish. Spek & Bone is wonderful. We stopped off there on our way home from a visit to Franschhoek (more of which later) where we’d eaten rather a lot over the past 24 hours, so tapas suited us perfectly and we didn’t order that much. Having said that, I thought the portions were very generous. I did feel somewhat conflicted eating bacon and crackling considering the name of the restaurant. But don’t worry, Spek is safe. The story on the menu assures us that he will never be eaten – “he sleeps on the couch and we love him dearly”. Thank goodness for that. 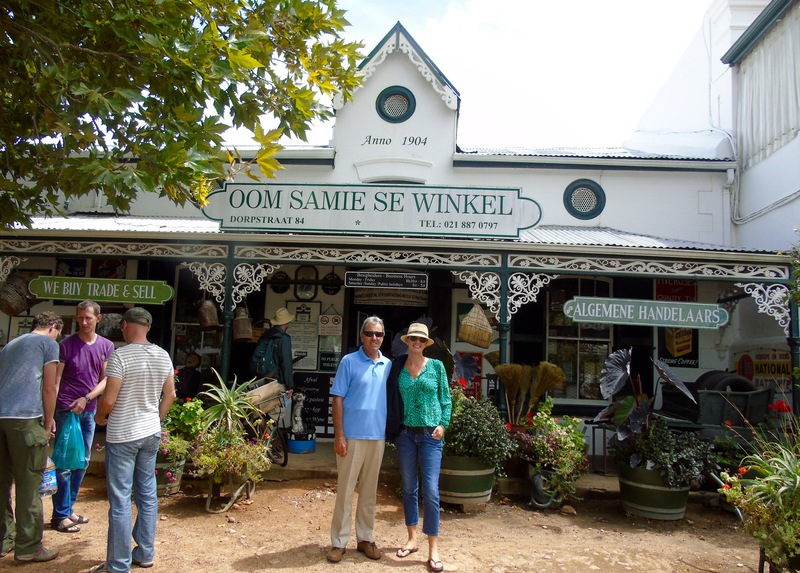 Right next-door is the legendary store – Oom Samie Se Winkel (which means Uncle Sammy’s shop), a Victorian-style shop that sells all food, gifts, souvenirs, antiques and all sorts of goodies. It’s a Stellenbosch institution since 1904 that’s set out over 10 rooms and it’s really well worth a visit. Lunch for three cost R540 (£32 at today’s exchange rate). This included the dishes above, a lovely bottle of Rose and service. 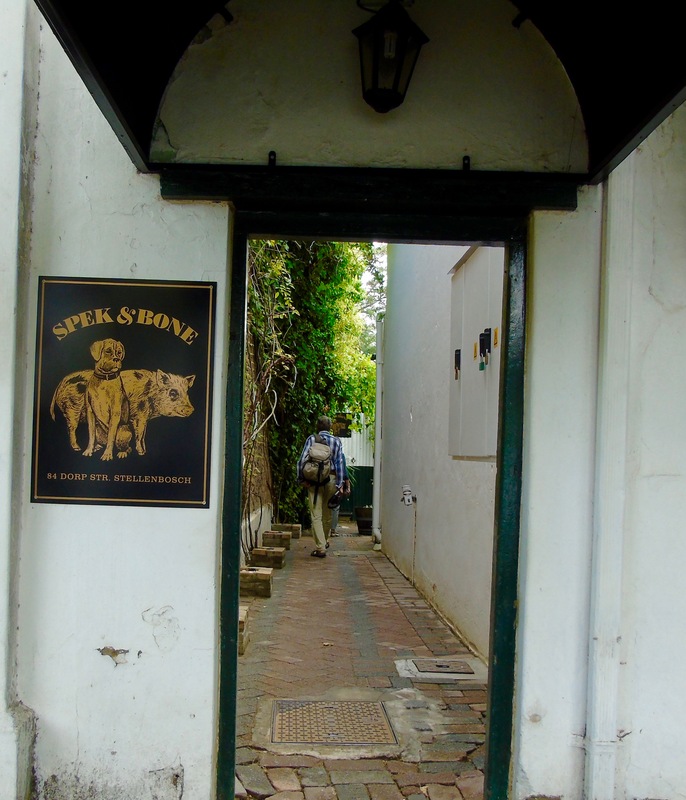 Spek & Bone is at 84 Dorp Street, Stellenbosch.